What you decorate your walls with says a lot about you -- put up pictures of Kobe, and people'll assume you're a jock; put up pictures of secret service agent Clint Eastwood, and people'll think you're John Malkovich, but with a prosthetic nose/chin, and a plastic gun that can go through any metal detector known to man! Giving you all sorts of other options: Blik. 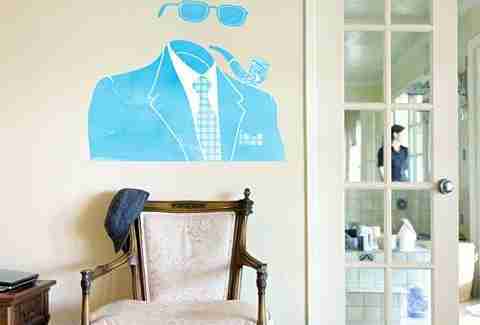 Blik's a Venice-based company dedicated to licensing/creating stickable/removable art for your walls, started by a duo consisting of an architect and a food editor, which would make a hilarious sitcom if they added half a man. 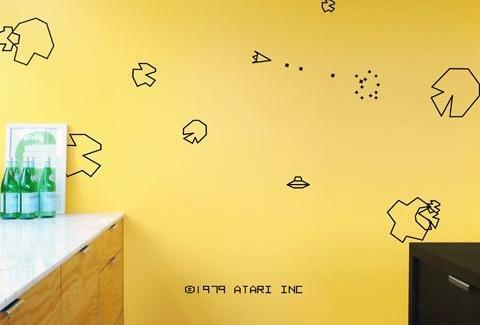 All their graphics're made of a self-adhesive, matte vinyl film, which sticks to your wall without chipping paint; just-dropped prints include Atari-based options like a set of Asteroids being blown to bits (and smaller bits), a Pong setup that includes everything from the score to the jagged, screen-dividing dotted line, and Centipede, which's got 97 different graphics ranging from the bug itself, to the mushrooms that it eats, to scorpions, which you must avoid despite their repeated demands to "GET OVER HERE". In addition to the Atari-ness, they've got full levels of classic Nintendo games (Super Mario/ Donkey Kong/ etc), an Anime-ish Asian girl that's a collab with streetwear company Upper Playground, and a graphic of an invisible man smoking a cigar and wearing a suit (or is he?). Blik's also got a party w/ Threadless tomorrow at their HQ, w/ free scream from Lake Street Creamery and giveaways from both companies, hopefully involving balloons, since liking them says a lot about you, and the security positions Clint Eastwood plans to take.